The artwork for Salamander greets you with a vibrant warmth: a glowing and alluring amalgam of reds and oranges that is both classy and intense. It is therefore the perfect visual embodiment of the aural splendour that awaits the listener, for the music presented on Salamander is all of these things... and so much more. On this, their second recording, you get a real sense that the trio have really hit their stride, finding a shared energy and rapport that undoubtedly results in some of the most spellbinding music you're likely to hear this year. Billing themselves as "an acoustic trio with a broadly European repertoire," Bellevue Rendezvous' success can be partly attributed to an absence of musical boundaries, that enables them to draw from a diverse and stimulating palette, with an intoxicating array of rhythm and melody that holds the listener's attention. Gavin Marwick's fluid fiddle playing provides a nimble agility that is perfectly juxtaposed against the full-bodied depth of Ruth Morris' nyckelharpa, whilst the punchy rhythms of Cameron Robson's cittern and guitar provide an intricate framework that binds their overall sound. The opening set of tunes is an animated affair with an instant and undeniable appeal; contemporary and traditional Swedish tunes meld to wonderful effect, with the three instruments entwined in a racy and intricate alliance that lasts for a mouthwatering eight minutes. This is followed by "Hanter Dro," a dance tune from Brittany with a sterner, more measured melody, and an assuredly classy presence. Gavin Marwick's own creative ingenuity is revealed on a number of occasions on Salamander, with his tunes absorbing a broad range of traditional influences. "Firedance" perfectly captures the personal sadness and adrenalin of the Irish immigration that influences the composition, whilst "Trip To Uppsala" depicts the excitement and anticipation of a much happier journey. "Makedonsko Devojche," (Macedonian Girl) is an achingly emotive piece of music, with a tranquility that effortlessly evokes an intense montage of reluctant sorrow, quiet strength, and reassuring beauty. The potency and empathy instilled in this interpretation is overwhelming in its meticulous detail, and a real testament to the remarkable calibre of the three musicians. Salamander retires gently and gracefully with the Scandinavian "Herding Song," leaving you in a state of awe, and eagerly awaiting the next instalment of Bellevue Rendezvous' pan-European ramble. Salamander should cement the position of Bellevue Rendezvous as one of the foremost talents in traditional music, with a sound that stands out as truly distinct and imaginative. The opportunities for a band that truly embrace the full gamut of European traditional music is seemingly endless, and in the hands of Bellevue Rendezvous it would doubtless be an exhilarating journey on which to embark. Bellevue Rendezvous was the surprise of the evening. With a name like that, I was expecting French cafe music, and I was wrong in the best way possible. Bellevue Rendezvous is comprised of three topnotch musicians, and the sound is very much a world music treat. Fiddler Gavin Marwick alone would be worth the price of admission. He lights up when playing, dancing and grinning and producing wonderful music. His musical CV includes working with groups like Cantrip, Burach, Ceilidh Minogue and lots of session work, but he’s probably best known to Oak & Thorn listeners from his old band The Iron Horse (“The 8-Step Waltz” is a favorite). Ruth Morris’s nyckelharpa playing lent a gravitas to many pieces, when she wasn’t leading the way into monster polskas and fairy dances. Cameron Robson support with Jew’s harp and bouzouki was grand. The trio’s set bordered on otherworldly at times, capturing the senses with a sound reminiscent of the Nordic supergroup Våsen. The audience – including us – were enchanted. They have two CDs, “Salamander” and “Tangents,” which you’ll hear soon on Oak and Thorn and quite probably on World Tour as well. SALAMANDER REVIEW: "Elemental, mesmeric, extraordinarily beautiful. The second CD from this string trio is an absolute triumph. Named after a rather obscure district of Edinburgh, Bellevue Rendezvous combines the formidable fiddle talents of Gavin Marwick (Spootiskerry, Cantrip, Ceilidh Minogue) with Ruth Morris' spinetingling nyckelharpa and Cammy Robson's exceptional accompaniment on cittern and jaw harp. A repertoire of darkly enchanting tunes from all over Northern Europe, arranged for maximum effect: Salamander really is something special. The exotic build-up to Gabriel's Step is full of the earthy power and edgy elfin grace of a certain type of French folklore: the fact that it's in 5/4 time goes almost unnoticed. Changing into the angelic sweetness of Byss-Calle 32, the Swedish nyckelharpa really shines - a glow which persists throughout the album. I've always been a fan of Mr Marwick's music, but I wasn't taken with Bellevue Rendezvous' first recording: it didn't quite gel, and there wasn't enough contrast in the material. Salamander is a totally different beast. It's an amphibian for a start, at home in two environments, and this duality is reflected in the different tones here. Take the inspired combination of a Breton Dro, hypnotic and repetitive, with the simply gorgeous Tuolpagorni from Lappland. A stately Swedish waltz glides into the jaws of a ravening polska. Cliff Stapleton's gyrating Man in the Brown Hat is paired with the equally frenzied La Sensonette, another French gem. The final Herding Song provides a total contrast, gentle and understated, a musical de-tox before you press the play button again. A range of composers feature on this album, but Gavin Marwick's compositions are numerous and noteworthy as ever. The title track combines three of his tunes, the distinctively Scots Trip to St Kilda, the trancelike triple-time Joel Turk, and the fiddle fiesta Salamander. His Firedance medley is another salamander reference, dramatic and powerful like a midwinter bonfire. Gavin's stately march Nyckelharpa is followed by a joyous jig he calls The Fourth Health. As if this wasn't enough, Bellevue Rendezvous add a couple of Eastern European tracks, the sorrowful Macedonian Devojche and the pair of Klezmer dances from Warsaw. Salamander is truly fabulous, cathartic and invigorating: very highly recommended and already likely to be in my 2010 top ten. Google it." BESIDES the pun on Sylvain Chomet's much-loved movie, the first part of this instrumental trio's name references fiddler Gavin Marwick's Edinburgh address when he formed the group in 2006, while the second denotes the meeting of disparate styles and influences that first took place around his table, and is now Bellevue Rendezvous' primary trademark. A repertoire comprising traditional and contemporary tunes from Scotland, Ireland, England, Wales, Brittany, Sweden, Finland, Lapland, Serbia, Macedonia and beyond, plus a similarly cosmopolitan array of original compositions, might seem to suggest some jack-of-all-trades musical soup, but the contrasting and distinctive concentration of their line-up – completed by Ruth Morris on nyckelharpa, the Swedish keyed fiddle, and Cameron Robson on cittern – creates a unique underlying unity without homogenisation. Three weeks into their current tour, promoting their excellent second album, Salamander, they were all so snugly in synch as to sound at times like a single big instrument, at others like a small orchestra. Again, though, this was built on careful definition and fulfilment of their individual roles, each player scrupulously exploiting the full sonic and dynamic palette at their disposal, from the grainy, cello-like plangency of Morris's lower register to Robson's jackhammer percussive attack. Great band, great show, great night! A full house roared and cheered an acoustic set played in candle-light by Bellevue Rendezvous on Friday night. Rarely has a power cut been so much fun. 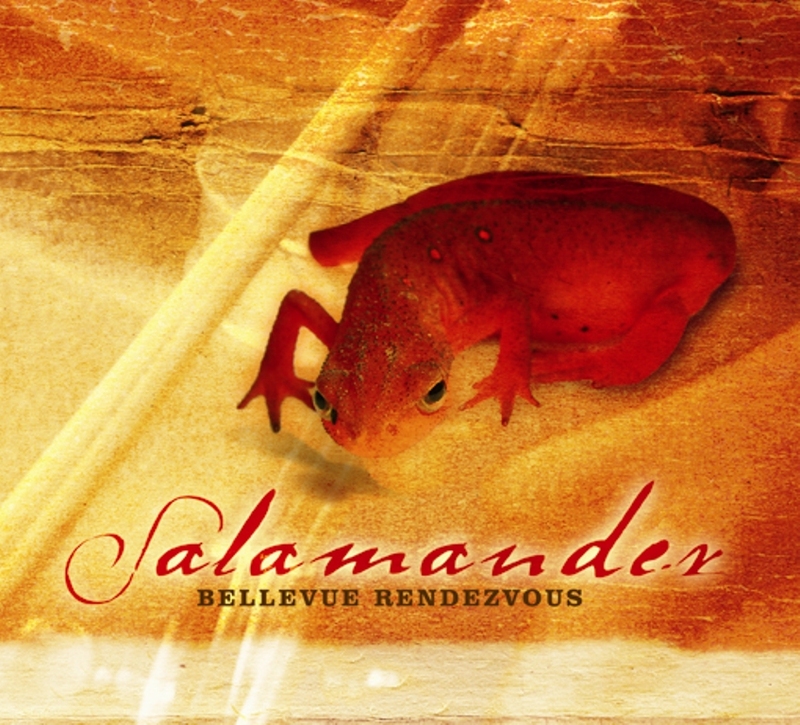 Jill Turner makes a date with: Bellevue Rendezvous, who demonstrate that they are specialists in all styles with their second album Salamander. Original tunes written for theatre productions sit side by side traditional European dance tunes and played seamlessly with a lightness of touch, a skip in their step and a depth of emotion where necessary from this Scottish acoustic trio. Bellevue Rendezvous, recent participants at this year's Celtic Connections, comprise, Gavin Marwick on fiddle, Camerson Robson on cittern, guitar and jaw harp and Ruth Morris who plays the most complicated and awe inspiring stringed instrument, the nyckleharpa. Its not only their incredible musicianship but the way the instruments interplay to create atmosphere, the bowing of the cittern, the dark grainy effect of the nyckleharpa, the mysteries of the jaw harp. They also create interesting combinations and contrasts, placing darker tunes together with a livlier jig, formality with wild abandon, switching leads, new tunes, old tunes, dark and light together, it makes a fascinating listening experience. Amongst the airs, klezmer numbers, the frailachs, reels, Breton trance and Swedish dance numbers, there sits a tune written for a Traverse Theatre production, Alexander Salamander, A Tale of a Teenage Pyromaniac, billed as gleefully dark and fiery, it lends the album its name and sums up its character beautifully. Salamander is released on 25th January on their own label Journeyman, with assistance from the Scottish Arts Council. The late Hamish Henderson is often cited as one of the greatest champions of Scottish traditional music but his perspective of music in particular and art in general was truly international. So he would have appreciated the music that kicked off the ninth Carrying Stream celebration of his life and legacy. Bellevue Rendezvous are a group whose repertoire isn’t measured in notes so much as air miles. A typical medley might take in Brittany, Sweden, Wales and Ireland as tune sources and there are trips to Serbia, Finland, Galicia and St Kilda, both real and imagined, that have begun life being worked up round a kitchen table in Morningside, in a flat, it’s hurriedly pointed that out, that was rented. The kitchen-session closeness remains at the heart of the trio’s playing as fiddler Gavin Marwick engages in unison phrases with Ruth Morris’s nyckelharpa and meshes with the rhythms and melodies of Cameron Robson’s cittern to create a sound that’s almost liquid in the way it changes shape to suit metre and mood. Theirs is a genuine collective energy and can build sufficient momentum to turn a polska set into a thrash metal finale but they’re equally concerned with the spaces between the notes. The Herding Song featured what might be termed “pause and effect” as it used brief intermittent rests as a subtle but major part of its quietly keening charm. Robson’s occasional use of jaw harp was another source of energy and contrast over two sets during which you never knew where you might end up next geographically but you knew you were in the safe hands of three expert co-pilots. SONGLINES: Edinburgh-based Bellevue Rendezvous might be a newish name on the folk scene, but the individual members’ sheer musicality and years of experience on the traditional scene make for a recording of real beauty. Ruth Morris took up the nyckelharpa after attending the luthier’s festival at Saint-Chartier in Central France and her playing reveals warmth and depth. Superbly expressive fiddler Gavin Marwick is also a member of Scotland’s mighty folk orchestra the Unusual Suspects. Cameron Robson is known for his detailed bouzouki and guitar playing with bands including Deaf Shepherd. This is a sparkling collection of beautiful, lively traditional tunes garnered from the UK, Serbia, France, Macedonia, Poland, Canada and Scandinavia. Gavin contributes a superb set of his own tunes too, including the moving ’Tribute to Joe Scurfield.’ These musicians have soaked up the traditional influences of many countries for years, and tunes by the likes of Donal Lunny, Eric Olsson and Farquhar MacDonald are lovingly handled here. Together, the three instrumentalists combine to create a detailed, vibrant and expansive sound, and there’s an ocean of lyricism here. I witnessed this band as being a key part of the hardworking Scottish contingent at the Festival InterCeltique de Lorient this year; their beautiful playing delighted the Breton audience just as it captivates the listener in this high quality recording. 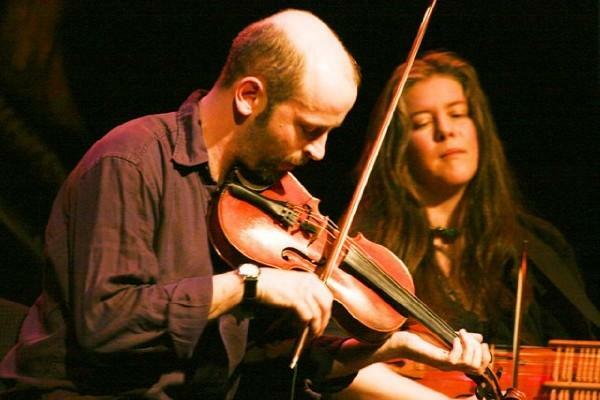 Bellevue Rendezvous are an important part of a thriving UK Celtic music scene that has spawned an innovative wave of musical expression, including the so-called ’Nu-Nordic’ scene, a musical ’bridge’ spanning the UK and Scandinavia. Boundary-crossing collaborations such as Donald Shaw’s Harvest extend an equally receptive hand towards the musicians of France and Spain. The rules are gradually being re-written, and bands like Bellevue Rendezvous are helping to lead the way with their exquisite interpretations of tunes collected on their travels. take on something of a Caledonian feel in the hands of these two. The third contributor is Cameron Robson who is the ideal accompanist of bouzouki and guitar on this evidence - always lifting the music and never intruding. Self-produced debut albums don't get much better than this. Bellevue Rendezvous took to the stage first, unassuming and unannounced. Their mixture of Celtic and European tunes held the audience transfixed, cheering and applauding between numbers. While European music can be dark and foreboding, the band kept it from becoming too dark with a healthy sense of humour and some excellent performances that suggest they ought to be on a bigger stage somewhere soon.